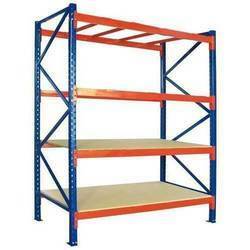 Manufacturer of a wide range of products which include round file rack, heavy duty racks, slotted angle racks, panda shelving system and industrial racks. Color Available Light Grey, Beige, Brown etc. Perfect Solution For Storing And Retrieving Office Files & Folders. A Filing System That Grows As Your Needs Grow! Round File Rack saves up to 60% of the space needed for other filing systems. Round File Rack provides maximum ease of retrieval in minimum space. Round File Rack saves expensive office wall space. 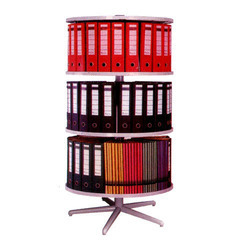 Round File Rack is the most economical filing system available. The price comparison shows that Round File Rack saves up to 50% in cost as compared to conventional wall filing systems. Why pay more when planning offices? Check and compare! With Round File Rack you retrieve your files at the greatest possible speed. 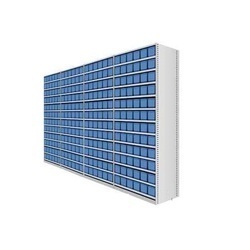 Each tier revolves independently to display 24 Box files or 80 to 100 flat files at a glance. We feel proud to introduce ourselves as the leading organization in this domain, engaged in presenting an excellent grade of Heavy Duty Racks. Bestowed with an ingenious team of designers and advanced production unit, we have been able to introduce an exclusive range of Slotted Angle Racks. Panda Shelving Systems have one-piece solid uprights with a rolled front edge for additional strength, safety, and aesthetic appeal. Roll posts are available in 3 heights 1275 mm, 1875 mm, 2375mm which are suitable for 300mm, 400mm, 450mm, 500mm, & 600mm deep shelves. Back panels provide additional stability and prevent dust. As per the new design, the back plate is a set consisting of 2 pcs. All shelving bays are fitted with solid kick plates, which prevent unwanted material to enter inside the base of the shelving unit and It looks aesthetically good. Panda shelving systems are fully enclosed and are designed to suit your ever-changing needs. The flexibility of the product accommodates additions or alterations at any stage, with a minimum of fuss or disruption to your day to day operation. 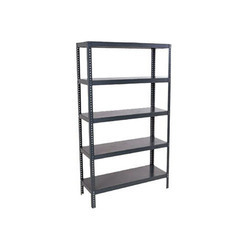 All Panda shelving components are manufactured in 0.8mm CRCA steel and are duly powder coated in light grey color. ASUS 300 300 900 33 70Kg. ASUS 400 400 900 33 60Kg. 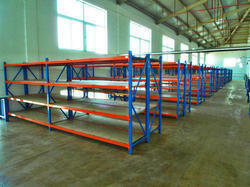 Since our foundation, we are engaged in presenting an outstanding quality array of Industrial Racks.